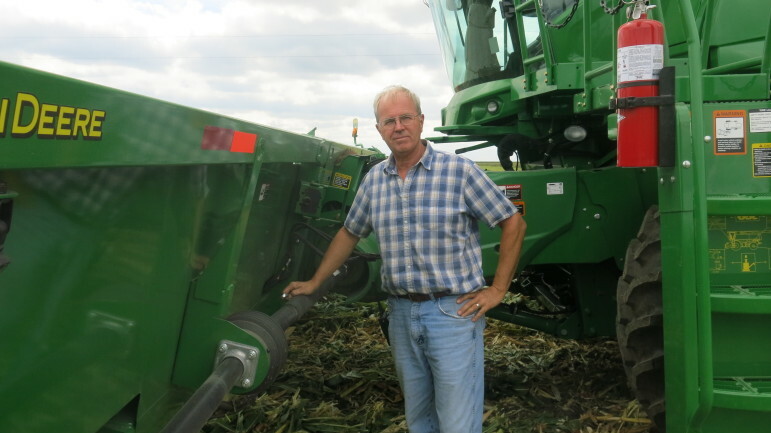 Illinois farmer Len Corzine buys has bought expensive new farm equipment each year for several years in order to ensure his tractor and combine hold up during harvest and planting. On a hot day in late August, Kevin Bien stood amid the shade of a large gray piece of farm equipment. The brand marketing manager for Gleaner Combines gave his best spiel to a group of farmers attending the Farm progress Show in Decatur, Ill. Torque, efficiency and new technology were among his key points for the prospective buyers of the large machines that can run anywhere from $300,000 to $500,000. And farmers are buying. Frequently. Listen to the story on "Harvest Public Media"
It has been a good time to be in the farm equipment business the last few years, whether you’re a manufacturer such as Gleaner or the local tractor dealer. A strong farm economy paired with a couple of business tax breaks have allowed some farmers to buy the expensive new equipment every year. But with falling grain prices and expiring tax breaks, there may be a few speed bumps ahead. There was no sign of concern, though, on a sunny, windy day in central Illinois in early September. Len Corzine was gearing up for the first day of harvest season. He and his son farm 3,000 acres in Christian County. On this day they were putting their new John Deere combine along with a new tractor and new grain wagon into the field to start picking corn. Corzine, 63, said he’s been buying a new combine and tractors every year for a long time because he doesn’t want an equipment breakdown at a crucial moment. Corzine said the local dealer has another farmer who will buy Corzine’s used equipment, keep it a year and then trade it in for Corzine’s next combine and tractors. Over the last six years, sales have increased for both tractors and combines. According to the Association of Equipment Manufacturers, new tractor sales have jumped more than 10 percent and combine sales were up 8 percent. The latest report from the association shows overall sales is on pace this year to top 2012. Technology, too, is another factor driving farmers’ purchases of new equipment. A combine can now almost drive on auto-pilot using GPS, and the driver can look at a screen and see readings on the moisture in the crop and how much has been harvested. When planting, a computer program can tell the equipment how much seed to spread and the quality of the soil. And thanks to high commodity prices, farmers have been able to afford that technology. There has also been the benefit of a couple of tax advantages to help business during the recession. 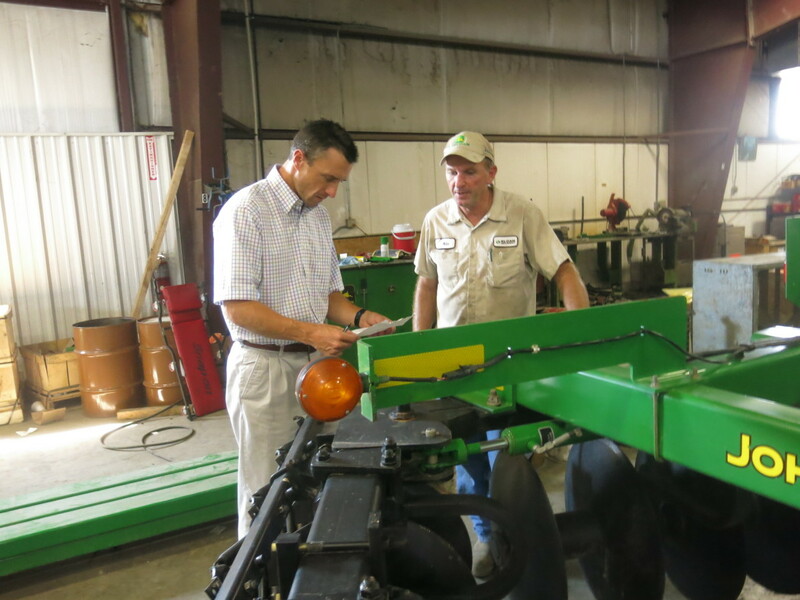 A business investment deduction allows farmers to deduct up to a $500,000 from their federal taxes for purchasing equipment, rather than the $25,000 level it had been a decade before. In addition, those who buy new equipment have been able to take advantage of a bonus deduction. The business investment tax breaks is set to reduce at the end of this year and the deduction for new equipment is scheduled to go away. Industry observers say that could slow sales of expensive farm machinery. “I think it’s reasonable to say that we will probably see a slackening in demand for ag equipment –particularly new ag equipment,” said Roger McEowan, director of Iowa State University’s Center for Agricultural Law and Taxation. Still, Jim Steck, with Sloan Implement in Assumption, Ill., said if grain prices hold steady he expects farmers to keep buying. His company sells John Deere equipment throughout Illinois and southern Wisconsin. Steck noted that even before high corn prices set in, he had people trading for new equipment each year and now with the growth in technology, that makes it even more attractive for farmers to shop new. “I still think guys are going to trade equipment. Because if there’s technology changing and they don’t want equipment that’s worn out because of downtime, they’re still going to trade equipment,” Steck said. The tax breaks are not just earmarked for farmers, but business in general. However, McEowan expects renewed calls for Congress to extend the break beyond its expiration at the end of 2013, because of sales it has helped generate for agriculture manufacturers.